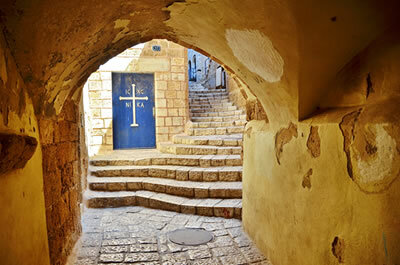 Join us to an amazing, inspiring, life-changing experience to the Holy Land. Here are just a few of the places and holy sites you’ll visit during our Signature Where it All Began 15 day Holy Land Tour to the Land of the Bible. 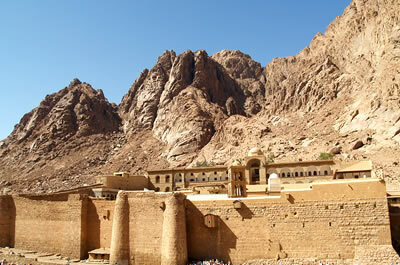 Egypt to Jordan: Egypt, famous for the Nile River and the Pyramids, is of deep religious significance in Bible history. Under the shadow of Egypt the nation of Israel emerged out from the Exodus (Book of Exodus). Moses, born and educated in Egypt is credited by tradition of writing the Five Books of the Bible; Genesis, Exodus, Leviticus, Numbers, and Deuteronomy, with many of the events taking place in Egypt. Mt Sinai is revered by Jews, Muslims, and Christians, all of whom believe that Moses received the Ten Commandments by God (Exodus 20:1-17) at the summit. The mountain is stunning and not difficult to climb for most pilgrims, and it provides a magnificent view of the surrounding area. Petra, (Isaiah 2:10) is one of the world’s greatest archaeological sites, and Mt Nebo from where Moses viewed the Promise Land (Deuteronomy 34:4), are situated in Jordan. Cairo the capital of Egypt and the birthplace to one of the greatest civilizations of the ancient world is also home to one of the Seven Wonders of the world, The Great Pyramids of Giza. Pyramids of Giza visit and experience one of the Seven Wonders of the ancient World none more impressive and one of the greatest architectural feats in human history. Great Spinx the largest monolith statue in the world, and the the oldest known monumental sculpture, and is commonly believed to have been built by ancient Egyptians of the Old Kingdom during the reign of the Pharaoh Khafra. Egyptian Museum the Egyptian Museum in Cairo contains the world's most extensive collection of pharaonic antiquities; no visit to Egypt is complete without a trip through its galleries. Old Cairo the City’s cultural landmarks that span three millennium of Egyptian history. Old Cairo is the home of Cairo's Coptic Christian community which traces it's roots to Saint Mark the Apostle in 42 AD. Coptic Cairo is a part of Old Cairo which encompasses the Babylon Fortress, the Coptic Museum, the Hanging Church, the Greek Church of St. George and many other Coptic churches and historical sites. Hanging Church is one of the oldest churches in Egypt and is named for its location above a gatehouse of Babylon Fortress. Saints Sergius and Bacchus Church is traditionally believed to have been built on the spot where the Holy Family, Joseph, Mary and the infant Jesus Christ, rested at the end of their journey into Egypt. Mt. Sinai the mountain where God gave laws to the Israelites, and where the golden calf was forged (Exodus 32). St. Catherine Monastery at the foot of Mt. Sinai the oldest working Christian Monastery, and where it’s believed God appeared to Moses in the form of a burning bush (Exodus 3). Aqaba is Jordan's window to the Red Sea. Historically the same city as Eilat on the Israeli side of the border. In biblical times, Israelites passed by the area during their wilderness journey (Numbers 33-35). Today it offers a relaxed small-sea-town atmosphere popular for local getaways and a destination stop to or from Israel and Jordan or Egypt. Petra one of the world’s greatest archaeological sites -the 2,000-year old city known as the red rock city. It was the ancient capital of the Nabateans from the 3rd century BC to the 2nd century AC. Carved by the Nabataeans out of solid rock. Amman is the capital and most populous city of Jordan. It is the country's political, cultural and commercial centre and one of the oldest continuously inhabited cities in the world. Atop Jabal al-Qala’a hill, the historic Citadel includes the pillars of the Roman Temple of Hercules and the 8th century Umayyad Palace, known for its grand dome. Built into a different downtown hillside, the Roman Theater is a 6,000-capacity, 2nd-century stone amphitheater offers occasional mdern events. Madaba an ancient town in Jordan known for its 6th-century mosaic map of the Holy Land in the Greek Orthodox Church of St. George. Mt. Nebo from where Moses viewed the Promise Land, and believed to be the site of the tomb of Moses. Tel Aviv, Western Coast to Meggido region: Tel Aviv, a city situated on the Mediterranean coast, is a unique cosmopolitan metropolis where new meets old with contemporary architecture, promenades, stunning beaches, restaurants and street cafes. Minutes from Tel Aviv, Jaffa is where the Apostle Peter made the miracle of raising Tabitha from the dead (Acts 9:36-43), and a short 45-minute drive up the Western Coast are the ruins at the Caesarea National Park. An ancient port city built by King Herod the Great that once rivaled Carthage and Alexandria and was the center of early Christianity (Acts 9:30, Acts 10:24-48). 35-minutes farther up the Western Coast is Haifa with Mount Carmel (1 Kings 18:16-24), and 37 km southeast-inland is Megiddo. The New Testament’s Book of Revelation foretells the ultimate reckoning on this very location. The Scriptures (Revelation 16) describes seven bowls of God’s wrath poured onto the earth – death in the seas, plagues of sores, rivers of blood – and a final gathering of the armies on the hill of Megiddo, named Har Megiddo in Hebrew, giving the word ‘Armageddon’. Tel Aviv ('Hill of Spring' in Hebrew) in biblical times the area was known as Joppa, where Jonah flees from the Lord and was later swallowed by a huge fish (Jonah 1). It is not until the prophetic return to Zion in the late 19th century the nearby area of Joppa is settled and the city of Tel Aviv is founded. Old Jaffa (Joppa) where cedars from Lebanon arrived to build Solomon’s Temple (2 Chronicles 2:16). Where Peter came from Lydda to raise Tabitha from the dead (Acts 9:36-42), and where the apostle stayed at the house of Simon the Tanner. St. Peter's Church situated in Old Jaffa, marks the traditional site of Peter’s vision of the Great Sheet (Acts 10:9-16). Caesarea (Acts 9:30 Acts 10:24-48) the center of early Christians, and today an impressive archeological site. Built by King Herod, this is where Paul made his defense before Festus before his final journey to Rome (Acts 25-26). Mount Carmel where Elijah issued his challenge of the False Prophets (1 Kings 18:16-24). Meggido (Joshua 12:21, 1 Kings 9:15, 2 Kings 23:29 & Revelation 16:16) the site of Armageddon (Revelation 16). Galilee region: “And Jesus went about all Galilee, teaching in their synagogues, proclaiming the good news of the kingdom, and healing every disease and sickness among the people.” (Matthew 4:23). The importance of the Galilee in the life and ministry of Jesus is immeasurable. After all, when examining the New Testament texts 83 percent of Jesus’ miracles took place in the Galilee region. The dramatic miracle of walking on water (Mark 6:47-52). The multiplication of the loaves and fishes (John 6:1-14, Matthew 14:13-21). And it is Nazareth, the Galilee area where Jesus’ spent his childhood, and where the Holy Spirit descended like a dove into Jesus after being Baptized by John the Baptist in the Jordan River (Matthew 3:13-17), the river that flows in to the Sea of Galilee. Mt. Precipice believed to be the site of the rejection of Jesus (Luke 4:29 Luke 4:30). If time permits see Cana of Galilee where Jesus performed his first public miracle, turning water into wine at the wedding feast (John 2:1 John 2:11). 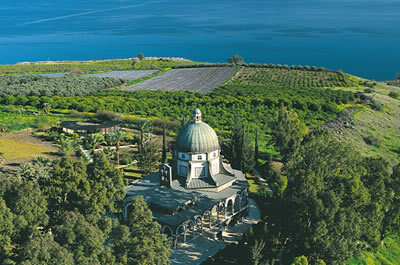 Magdala, known as the home of Mary Magdalene. Here we’ll explore the ruins of a first century Jewish town where a synagogue from the time of Jesus’ ministry was found. Tiberias today the capital of Galilee, was established around 20 CE by the Romans, and named after the second emperor of the Roman Empire, Tiberius. Tradition hold that the city is built on the site of the biblical city of Rakkath (Joshua 19:35). See the Ancient Jesus Boat, remains of a 2,000 year old boat that was used at the time of Jesus and his disciples located at the Kibbutz Nof Ginosar. Banias by ancient Ceasarea Philippi (Matthew 16:13 Mark 8:27) where the Lord said “On this rock I will build my Church” (Matthew 16:18). Yardenit on the Jordan River where believers celebrate and some take the opportunity to submerge themselves in the same waters the Holy Spirit descended like a dove from heaven when Jesus was baptized by John the Baptist (Matthew 3:13-17). Tabgha the site of the Feeding of the 5,000 and Primacy of Peter (Matthew 13, Mark 33, Mark 45, & John 21), see the Church of Multiplication. Beit She'an (Mark 5:20, Mark 7:31), view the impressive archeological site. It was here that after defeating Saul and his sons on Mount Gilboa, the Philistines hanged their bodies on the walls of Beth Shean (2 Samuel 21:12-14). Dead Sea region: The lowest place on earth, the Dead Sea (431 meters below sea level) provides amazing natural beauty, incredible ancient history, and is a place where you can rejuvenate with therapeutic Dead Sea mud, and swim and float in the cobalt blue water of the “Salt Sea,” as it was known by this name in the Bible. Masada the mountain fortress is beyond belief, and Qumran where the cache of ancient biblical text known as the Dead Sea Scrolls were discovered. 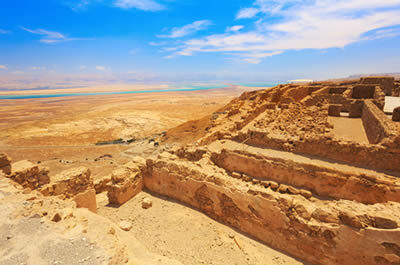 The Dead Sea area, unlike the Galilee does not figure prominently in the Scriptures however it was mentioned in the Bible when an army of Ammonites and Moabites crossed the shallow part of the Dead Sea to attack King Jehoshaphat (2 Chronicles 20). The Dead Sea- where you’ll have an opportunity to swim and float on the Dead Sea the lowest place on earth. Ein Gedi, an oasis in Israel where David hid in a cave when running from Saul (1 Samuel 23). 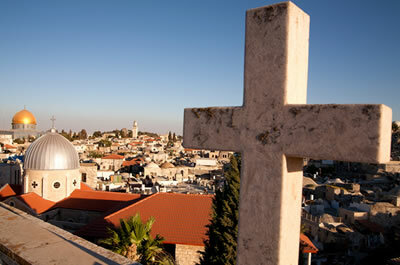 Jerusalem region: Jerusalem is of great importance to Christians. Jerusalem is the city where Jesus was brought there as a child, to be presented at the Temple (Luke 2:22-40), and to attend every year the Festival of the Passover (Luke 2:41). Where he healed on the Sabbath day (Mark 3:1-6), and where he cleansed the Temple (Matthew 21:12-17). Jerusalem is where the Last Supper took place (Luke 22), and where he was judged, condemned before Pilate (John 18:28-38), and crucified (Matthew 27:32-56, John 19, Luke 23:26-43). He rose on the third day from his tomb according to the Scriptures (1 Corinthians 15), and the Mount of Olives in Jerusalem is where the Lord ascended in to heaven (acts 1). Mount of Olives where the Lord ascended into heaven (acts 1). Dominus Flevit where “The Lord wept” as he beheld the holy city (Luke 19:41-44). Gethsemane (Mark 14:32, John 18:1 & Matthew 26:36) where you will see 2,000 year old Olive trees that date back to the time of Christ, and the place that Jesus prays (Luke 22:39). St. Anne Church and thePool of Bethesda, where Jesus performed the famous miracle of healing of the paralytic (John 5). The Via Dolorosa where we'll walk the Stations of the Cross including the Judgment Hall of Pilate (John 18:33), located at the Church of the Flagellation and Church of the Condemnation and Imposition of the Cross. Church of the Holy Sepulcher (Matthew 27, Matthew 33:57, Matthew 28:10) where you'll find the last Station 14 of the cross, and where pilgrims celebrate and mark the crucifixion and burial of Jesus. Mount Zion, visit the Upper room (Last Supper room) (Luke 22), Lord’s Supper, visit King David Tomb, and walk through the Jewish Quarter. Church of the Visitation which commemorates the visit made by Mary the mother of Jesus', to Elizabeth, the mother of John the Baptist (Luke 1:39-56). Bethlehem where Joseph traveled there (Luke 2:1-7) with Mary whom was pregnant, and where Jesus was born (Matthew 2:1-5), and visit the Church of the Nativity. The Garden Tomb, to celebrate the resurrection of Christ (1 Corinthians 15, Luke 24:6-7, Mark 16:5-7) with a time for prayer and reflection. My mother and I went on the "Where it All Began" Holy Land tour to Egypt, Jordan, and Israel and had the trip of a lifetime. Our family just completed a Holy Land tour to Israel full of wonderful sites and experiences.